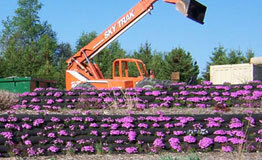 Dixon Shoreline / Landscaping is an erosion control company servicing Central Wisconsin with generations of experience. 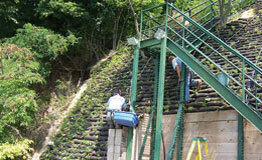 Our goal is to beautify and maintain our natural resources. We use native plantings of both forbs (native flowers) and grasses along with native trees and shrubs to help your fit into your surroundings seamlessly. 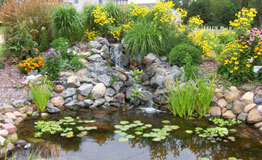 Enjoy the sound of a waterfall, or trickling stream as you relax to the beauty of colorful plants in and around your pond. We can create this for you! Most everything we do falls under or within shoreline regulations that is required in all counties. We will obtain the proper DNR permits required to complete your job. 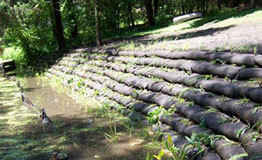 We also deal with storm water runoff issues both commercial and private in rural and municipal areas. Our goal is to use native rocks and plants from the area as to maintain a well balanced eco-system, which is friendly to the environment. Land & Water - The magazine of natural resource management & restoration. Working with mother nature not against her. We use native plants, an integral part of managing the environmental challenges.